Those who know me well are quite aware of the fact that I am a conference rat. I love conferences and, most of the time, they are an “excuse” for traveling somewhere and visiting some place new. So much so that whenever I travel my mom asks if I am going to attend any conferences. Well, sometimes I do travel to visit friends, you know? 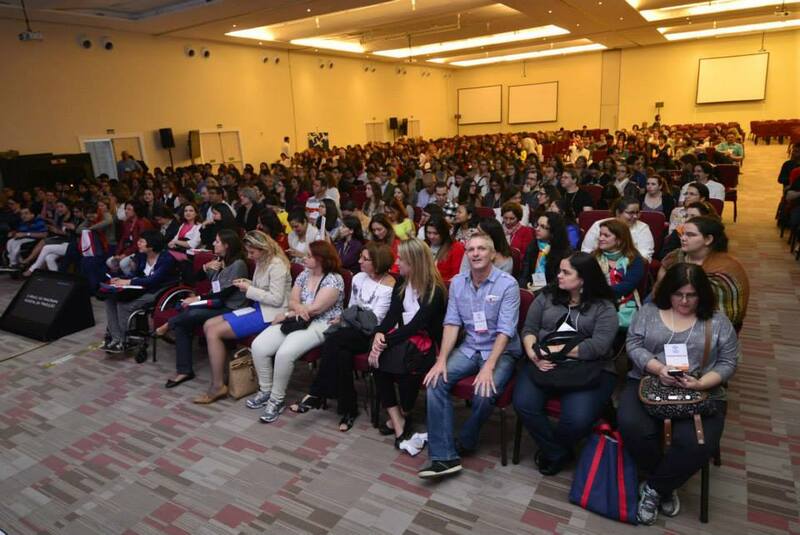 Keeping this conference newbie tiny issue in mind and the fact that the Abrates Conference is just around the corner, I decided to share with you some tips for successfully networking at conferences without simply throwing yourself at the people either. However, do NOT just randomly start giving your cards away to simply anybody with no reason whatsoever. Wait for the right time. Timing is everything when you want to make a good impression. In order to find the right time, first, you need to be open. When we feel shy, we tend to bury our heads in our notepads, mobiles, or even in the coffee break food. (Who never?) Look up, not down, and keep a smile on your face at all times. Do not be afraid of saying hi to people even when you do not know them, especially those who are sitting right next to you during the numerous talks. This openness is key to finding the right time to “strike,” besides making it easier for people to approach you. Approaching other attendees is not necessarily the worse thing ever. Small talk is there to rescue us! Comment about the icing cold air conditioning, the horrible Wi-Fi connection, the nice venue, the amazing lunch you just had, that coffee you terribly need, you name it, with the person who is sitting next to you. After breaking the ice, show interest and ask the person their name, what they do, where they are from, etc. And take the chance to ask for the person’s business card, so you can keep in touch. Naturally, they will also ask for yours. There you go. It does not hurt, does it? And you cause a way better impression when you show you are interested in knowing about the person than if you make it about yourself from the beginning. This approach can also be used during coffee breaks: comment about the amazing food, the interesting talk you just attended, how sleepy and in need of coffee you are… And repeat the same next steps: show interest to know who the person is and ask for their card. Another way of approaching other attendees is when you “know” them somehow: you always see them commenting/posting on Facebook groups, you like their blog/what they do, you are Facebook “friends,” you name it. These are great ice-breakers. In a nutshell, the key is to be friendly and open at all times, and take every chance to start a small talk and take it to the next level by showing interest at the person. Only make it about you if the person opens the floor for you to do so. If you engage with as little as one person per period (morning and afternoon), you end up with four contacts to follow up at a two-day conference. If you adequately follow up with them after the conference, these four people may introduce you to other people throughout the year and at the next conference as well. It is a vicious circle that only gets bigger with time, and one that works for itself, with no need to make such a great efforts anymore. Now, last but not least, it is also important to know how to properly follow up. Write an individual and personalized email to people you really liked meeting showing your appreciation. Do NOT simply add people on social media without sending them a private message reminding them exactly where and how you met, or where you know them from. Actually, this should be always applied, like a best networking practice. It is hard to remember every single person we meet at conferences, and anywhere for that matter. Now, I know this is hard to ask nowadays, but I actually prefer to follow their blog, like their Facebook page, follow them on Twitter, etc., instead of adding them as friends on Facebook or LinkedIn, especially those I did not really have a chance to connect that much. Should you have not done so yet, read Part 1 and Part 2 before proceeding. The first presentation I watched on the second day of talks was Patricia Moura Souza’s on the Translation Office 3000, a management software for translators. Patricia acknowledged that, although the TO3000 is not user-friendly, it turns out to be a great management tool for translators after you learn how to use it. It took the speaker three months to fully understand the program and totally depend on it for managing her translation work. So we can consider she is now a strong advocate of the tool – its ambassador, if we may say. According to her, some of its benefits is that the user can create and control budgets, invoices and payments by creating groups for services provided (such as translation, interpreting, editing, etc.). Patricia even reveals its greatest secret, that is not clearly understood from the interface: the vertical menu, on the left, refers to all the clients (general data) and the horizontal menu (in the top) refers to the selected client (data by client). And its three greatest functions are: relationship with the client (contact details, pricing list, payment methods, etc. ), workflow control (list of projects, specific information, delivery calendar) and financial control (invoices, payments, balance sheets, reports). Now something I particularly loved was that it has a specific tab for marketing! And you can also add other tabs. Other basic operations: you can use your CAT tool wordcount, you can customize fields, and there are all sorts and colors of filters! You can find Patricia’s PowerPoint presentation here. 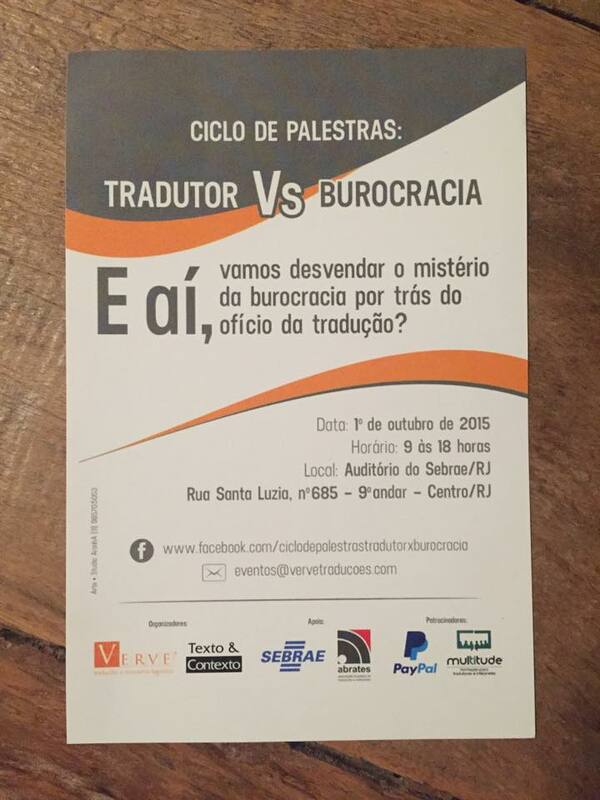 For more information about her experience with the software, read Como o Translation Office 3000 mudou a minha vida – parte 1 e Como o Translation Office mudou a minha vida – parte 2. You can download a 30-day free trial here. Should you love it and decide to buy the software, use this link. Next, I watched the beginning of Leonardo Milani’s talk on professional attitude, but unfortunately I had to leave early because my own presentation was next. However, I was able to grasp one important point: your productivity in terms of words per hour/day is not the same as quality. It does not indicate if you deliver a quality translation or not. And, for him, it is irritating to ask for productivity. As I said, up next was my presentation. I talked about how to use Facebook professionally as to positively, and not negatively, influence your professional image. However, I will write a more detailed post specifically about it in the upcoming days. Stay tuned. After my presentation, I ran to João Roque Dias’, on technical drawings. I must confess I just wanted to take a peek at it, so I did not even sit down. I stood in the back of the room taking pictures and tweeting a bit about his presentation, after all, the subject was not something that interested me, since I am not a technical translator of that area. However, to my great surprise, I had to take a seat, because João is certainly a captivating speaker and managed to catch my attention. The Portuguese speaker used attendees to compare both methods of ortographic projections, European and American, with “people” projections. According to João Roque, the translator should always be attentive, because symbols, displays and controls are not always translated. And picture captions should never be translated if the picture itself is not available for reference. If they are, they must be consulted. For example, a “disk” can mean different things in technical drawings, and the picture will tell which one it refers to specifically. João gave some tips about the translation of different types of documents with images. For example, in patents, bid documents and specifications, the text to be translated is almost 100% related to one or a few images, so we should start by studying the images and check if there are inconsistencies with/from the text. In manuals, instructions and leaflets, on the other hand, the text to be translated is clarified by numerous images, so we should study them as we go along, checking for inconsistencies with/from the text. At the end of his presentation, the charismatic speaker had some exercises about his talk and those who got the answer right earned cool customized freebies. It was certainly a pleasure to meet João Roque Dias in person at the conference. To sum up the best Abrates Conference so far, we had the surprise visit of Vera Holtz, a Brazilian actress, dear friend of Liane Lazoski, current President of Abrates. Her presence was also a surprise to Liane herself, and was organized by recently-elected President, William Cassemiro, and Vice-President, Renato Beninatto. They sang a song together; it was a quite touchy moment, summing up yet another fantastic conference in great style. You can watch her surprise entry and them singing here. Besides continuing all innovative actions of the last Boards and expanding the acknowledgement of the association, some of its proposed actions are to: expand the Mentoring Program, hold smaller events in other states of the country, offer courses at affordable prices to members, partner with universities, create departments (such as for Literary Translation and Interpreting), optimize the call service, improve the use of social media, etc. Suggestions from members will be always welcome. 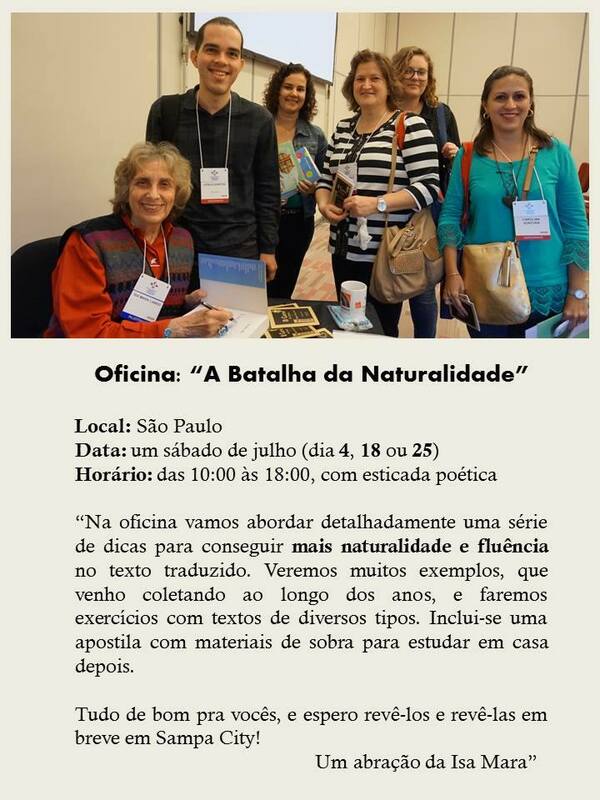 Although there is no defined date for the next conference yet, the venue is already set: São Paulo. According to the elected President, they will try to make it happen during the same period, early June. See you next year at #abrates17? And there are plenty of other links in Parts 1 and 2 as well. Enjoy! This is the second part of my post about the Abrates Conference. Read the first part here. After having such a good start, the second talk I watched on Saturday was Isabel Gorg’s, also on automated translation. The speaker conducted a survey and found out that 22% of the interviewees used some sort of MT strategy. Her presentation was mostly based on pointing out common mistakes in MT, such as spacing, capitalization, grammar, sentence structure, local standards and terminology. Being aware of their frequency makes it simple to spot and correct them. And, needless to say, source quality can also highly influence the quality of MT translations. The takeovers from her talk were: MT will not disappear, but rather get better; MT can increase productivity; we should concentrate on what MT does right, not wrong; and we should align our expectations. The third talk I attended on Saturday was by Felipe Cichini Simões, on personal and professional budgeting for freelancers. According to Felipe, we must never spend every cent we earn, but have some savings for vacation, professional investment, variable income, etc. The speaker suggested the YNAB (You Need A Budget) method and briefly showed us how the app works. According to Felipe, in order to start a budget plan, we must forget the past and start planning from now on. Felipe also said that giving each cent a function helps us understand what we can do with our money. Acknowledging our actual expenditures (besides our fixed ones) is also important for planning our future budget. However, he also points out that budgets are not always perfect, and sometimes they may not work as planned, especially for us, freelancers, who do not have a fixed income. It can happen, and we may not lose heart. The speaker also suggested the Wave Accounting app for financial control. I will surely try any of those apps, because I myself am very bad at budgeting and planning for the future. I know, shame on me! Next on the presentations I attended on Saturday was Adriana de Araújo Sobota’s, on how to start working with translation agencies. The large room was totally full and people loved her presentation. Adriana mentioned methods for receiving payment from overseas (PayPal, Moneybrookers, direct bank transfer, wire transfer through Payoneer and TransferWise) and how to check a potential client’s reputation (Payment Practices, Blueboard, Hall of Fame and Shame, Untrustworthy Translation Agencies). It is also important to check if they have a physical address, on-line domain, professional e-mail address, etc. When looking for translation agencies on Google, we should be careful with the search results, because they can return one-person companies/entrepreneurs, not only agencies. Adriana also mentioned the importance of professional behavior, having a good CV, knowing how to behave on-line, communication, etc. The translation market is fast, so we should make sure we do not lose a chance for nothing. All the information needed on how to find potential clients is out there: research and search for it. The speaker concluded her presentation stressing out some don’ts: do not depend on only one agency; do not pressure the potential client for the result of the test; do not ask if you can send a CV, simply send it; do not send bulk e-mails; do not complain about an agency in public (social media). After lunch, I attended GALA’s presentation, “Economic Crisis at Home? The World is Yours – How to Overcome Obstacles When Selling Abroad.” You can read more details about this one here, on a post I wrote for their blog. The program is totally free, from all parts: both Committee members and mentors are volunteers, and mentees do not have to pay to take part. To be a mentor, the person needs to be an Abrates member and have at least five years of experience in the area. To be a mentee, the person also needs to be an Abrates member and have a maximum of two years of experience in the area. 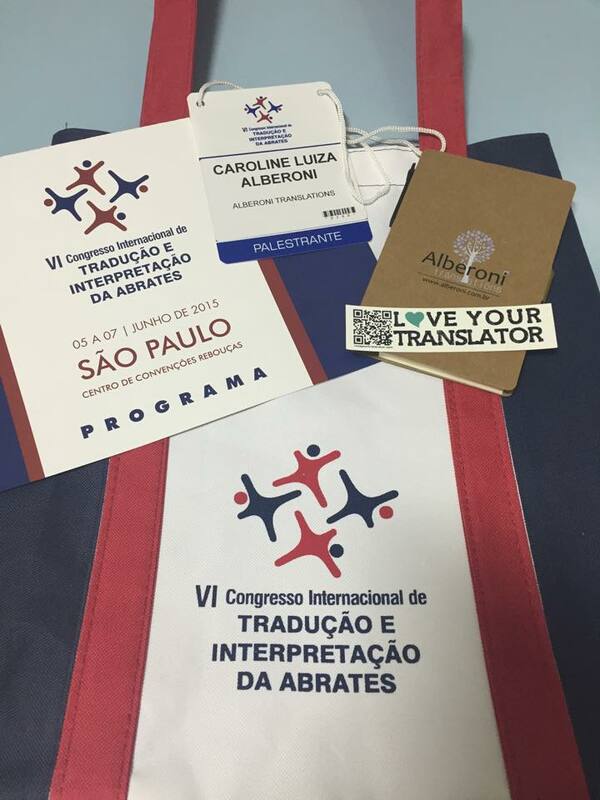 Or be in the last year of a Translation/Interpreting course. The program lasts two years with a minimum of two hours of mentoring per month (in person or via Skype or other method agreed upon both parts). The program’s coordinators closely follow their assigned pairs through follow-up reports both the mentor and the mentee have to fill out separately after every meeting. The coordinators must be aware of every decision made by their assigned pairs in order to avoid any potential issue, including change of date of the meeting. We had a fantastic feedback from our current mentors/mentees, from potential mentors/mentees and from people who run mentoring programs in other associations all over the world, such as Canada, Argentina and Israel. They were mesmerized by our organization, quality and professionalism. The presentation was followed by our own coffee break filled with positive comments, feedback, nice conversations with people who were interested at the program and future contacts. Should you be interested in learning more about it, do not hesitate to leave a comment below or send an e-mail to mentoria@abrates.com.br. To sum up a perfect first day, Renato Beninatto hosted a round-table about, once again, machine translation with Kirti Vashee, Ricardo Souza, Ronaldo Martins and Marcelo Fassina. Marcelo Fassina, from Lionbridge, started talking and said that usually material with low access by the general public or the end user goes through MTPE (machine translation post-editing). However, the agency must always inform the translator when they use MT. The translator’s feedback is extremely important to feed the MT and improve it, as Kirti also mentioned in this morning’s presentation. Ronaldo Martins took the floor and spoke beautifully and eloquently. I was in owe with his perfect choice of words. According to him, evolution is inevitable. Technology may close some doors, but it will certainly open other windows. Ronaldo explained the difference between accelerated, delegated and augmented technologies. The first ones are not revolutionary; they only assist, but do not replace; for example, bikes. The second ones are substitutive, but are not necessarily better than what they replace. The last ones, on the other hand, enable us to do things we were not able to do before. In spite of what people think, MT involves science. Ricardo Souza followed, representing translators. Last but not least, Kirti Vashee also gave his opinion on the subject. According to him, human translation is the driving force of technology. This was it for Saturday. Sunday talks in Part 3 (final). Other links can be found in Parts 1 and 3. 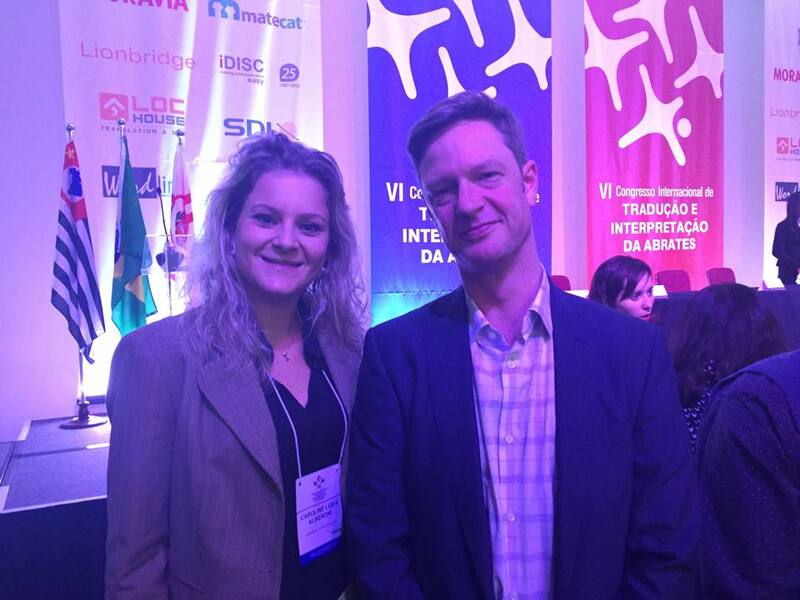 The 7th International Abrates Conference was held from June 3 to 5, in Rio de Janeiro, Brazil, our Wonderful City – that truly lives up to its nickname. It was an amazing event, way better than expected, in my opinion, even though there were less attendees than last year, probably due to our unfortunate financial crisis. However, those who attended the event were certainly not afraid of the threat and took the bull by the horns leaving their comfort zones, dusting off, polishing their knowledge, networking and prospecting. 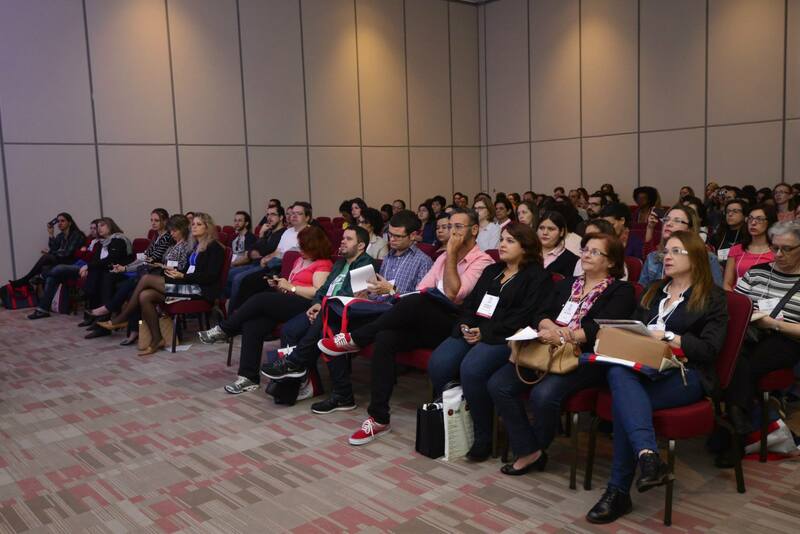 This year, the Brazilian Association of Translators and Interpreters (Abrates) also offered pre-conference courses in association with Café com Tradução on Thursday and Friday. On Thursday, Val Ivonica gave a basic course on memoQ. On Friday, Roger Chadel gave a basic course on Wordfast Classic; Val Ivonica gave a workshop on Regex (advanced memoQ); Carolina Caires Coelho and Flávia Souto Maior, from Ponte de Letras, gave a workshop on translation of literary texts from English into Portuguese; Cláudia Mello Belhassof gave a course on Brazilian Portuguese grammar; Daniele Fonseca, on interpreting and how to make decisions in real time in the booth; Ana Iaria and Ricardo Souza, on shipping and similar documents and their translation solutions; and Rayani Immediato and Mabel Cezar, on translation for dubbing and relationship with clients. They could be purchased separately, but with a discount for conference attendants. Also on Friday, in the afternoon, there was also the Abrates accreditation test. 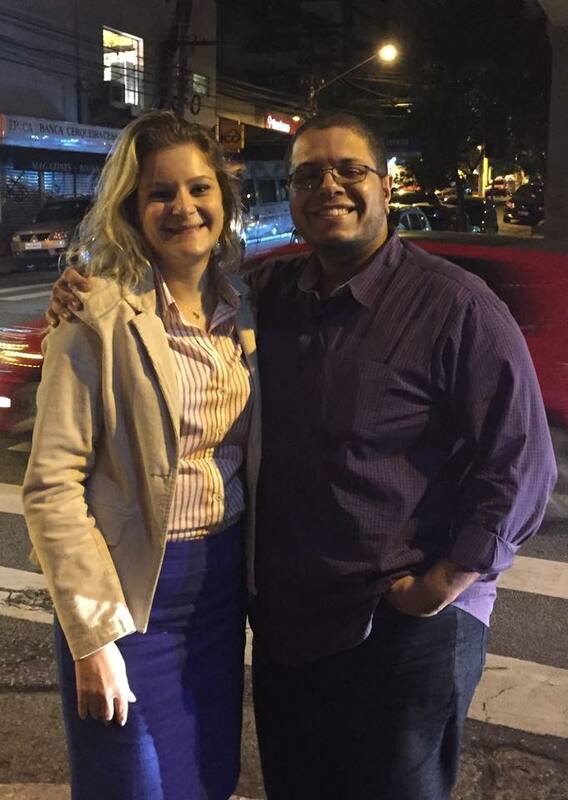 Social events started on Thursday with a happy hour organized by yours truly and Abrates Board members Dayse Boechat, First Treasurer, and William Cassemiro, Second Treasurer and recently elected President, at Inverso Bar. It was a nice opportunity to say “hi” and get to finally meet some colleagues in person, talk and relax a bit. Approximately 70 people managed to meet us there, so it was really pleasant and fun. On Friday, after the opening the ceremony, there was a toast with a buffet offered by GALA (Globalization and Localization Association). Another good opportunity to see those who arrived only on Friday. On Saturday, there was a dinner organized by Abrates with good food, drinks, music, dancing and lots of fun. I certainly had a great time and laughed a lot. Last but not least, on Sunday, last day of conference, Fabiano Cid organized a GALA networking get-together at Pub Escondido. Once again, we had such a great time and could relax from the hectic conference days. The conference’s official opening was on Friday evening. Before the actual opening interview, William asked if there was any sign interpreter who could volunteer to interpret the opening. Paloma Bueno Fernandes kindly volunteered and did a wonderful job interpreting the national anthem. Everybody turned their eyes to her and her amazing interpretation, beautifully followed by someone who was standing right in front of her. It was an unforgettable moment. Renato Beninatto then interviewed Cora Rónai. Cora is a journalist and daughter of Paulo Rónai, who was one of Abrates’ founder and also hold the position of President of the association. Paulo was born in Hungary, but moved to Brazil during the war. Besides being a translator, he was also a philologist and critic. Although Cora is not a translator herself, it was beautiful listening to her telling stories about her father, his many important friends, such as Aurélio Buarque de Holanda, with whom he exchanged lessons of Portuguese and French. Her father, as she said, was saved by translation. He was released from prison for being the only person who could translate from Hungarian into Portuguese. Some curious facts about Paulo were that he loved footnotes to explain translations and was one of the first people to have an electric typewriter. I had already heard Liane Lazoski (Abrates’ President) talk about him that same day in such a beautiful way and with such passion and admiration that inspired me to want to re-read his books. The first day of presentations started brilliantly with Kirti Vashee’s presentation, who talked about Corporate Utility and the General MT Technology Landscape. Kirti is a US-based independent MT consultant/expert and presented some quite interesting insights and figures on MT, for example, he said Microsoft spends US$ 500 million a year on human translation, but that accounts for only 2% of what they translate. Other companies that use MT in their translations are: Facebook, eBay, Google, Intel and Adobe. Some translation volumes are too high and cannot be met by human translators, so that’s when MT comes into play. “Good MT” allows more to be translated faster and at a lower cost. However, if there is legal viability and real importance, human translation must be used in order to avoid risks. Kirti said that in languages like Portuguese, Spanish and French, MT is getting better with time and can be a threat in case of repetitive material (Hungarian, Turkish, Korean, Hindi, Zulu and Swahili are, on the other hand, among the worst). According to a Google study (2012), Portuguese is the best MT language due to its greater and larger content. Our current scenario demands faster turnaround times, resulting in more information, therefore, in the need for faster translations. An interesting fact Vashee pointed out was that today we have more active scientists alive than in the previous 200 years all together. It is a lot of information being produced! What needs to be clear is that MT engines are not equal. Some are great, others are terrible. And the problem is most DIY initiatives are created by people who do not know what they are doing. We, translators, should take part and get more involved so we can change this scenario to our benefit. Human feedback can raise the raw output to previous unseen quality levels. It is worth knowing how to climb. Understanding MT output is key to determining opportunity value. Quality of the MT system can be even more important than rate per word. The best translators develop their own “effort scores” after seeing a meaningful sample of actual MT output. Kirti Vashee suggests Lilt, an adaptive dynamically learning MT environment that personalizes its suggestions to the translators’ translation style. Although it does not support all languages yet, it does support Brazilian Portuguese. In a nutshell, PEMT will become more common, so we have to learn to determine when it makes sense for us.